Ok, I know…lots of chicken lately, but for the longest time the thought of cutting the fat off of another dull chicken breast sounded just awful. It was gross and a hassle; and well, I was just sick of it. I was in the habit of buying those lean chicken breasts too, and let’s face it, breast meat just isn’t as tasty as the dark meat; so the combination of the simplicity of using a whole chicken and taste of using all the meat has been great. And yes, I was still in my low fat habit (old habits are hard to break), but now that we know we don’t have to worry about healthy organic animal fat, let’s enjoy some of the dark stuff! Anyway, today, I bought another whole chicken, threw it in the crockpot at noon added the ingredients below and turned the crockpot on high (for time’s sake). 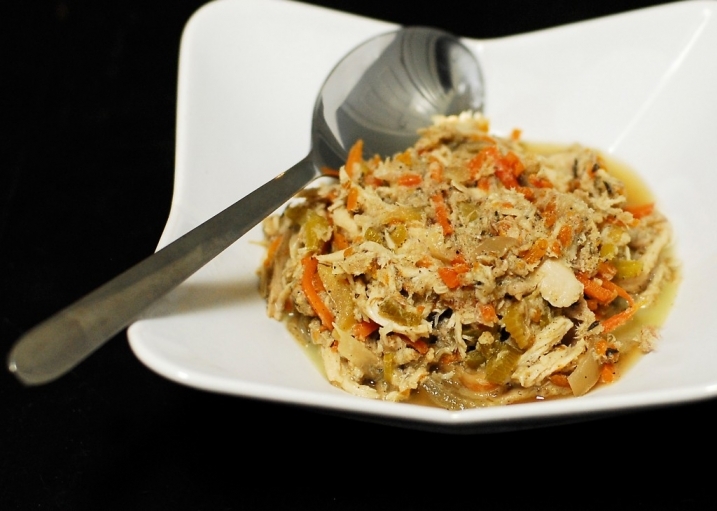 After 5 or so hours, we had a new favorite crock pot chicken dinner! Once the meat was done, I did take the whole bird out of the slow cooker, put it on a big plate, scrapped the skin off and put all of the meat back in the crock pot as the chicken literally fell apart. You just can’t get the meat any more tender or more flavorful with such little effort! Oh, and I actually added a few big bones back in the pot since I was going to let it cook on warm for a couple of more hours and wanted that extra flavor and nutrients. But that was it and gosh was it good, and, it went fast here!!! By the way, I saw jars of coconut oil at Trader Joe’s yesterday for the first time ever. Yay Trader Joe’s! Oh! And, do you like my new logo on the top left hand side? I’m very excited about it! Thanks Ashley! !